2015 Smart Reggae Fest is going to be EPIC! What does Belizeans voting no to I.C.J mean for Belize? Posted: Tuesday, May 19, 2015. 2:38 pm CST. Tuesday, May 19th, 2015: BMG: The 4th annual Smart Reggae Fest is set to be the biggest musical event of 2015 for Belize. 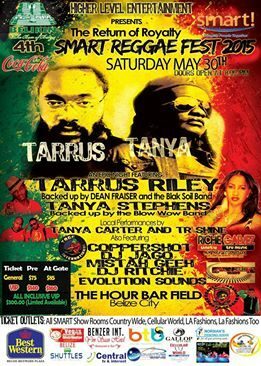 That is because the organizers, Higher Level Entertainment will be presenting Jamaican Royalty, Tanya Stephens and Tarrus Riley to grace the stage at the Hour Bar Field in Belize City. Local performances by Tanya Carter and TR Shine will warm up the crowd along with appearances by Coppershot, DJ Jago, Mistah Geeh, DJ Ritchie and Evolution Sounds who will be on deck to ensure an epic night! Ticket prices are as follows: General Admission – $75, VIP – $140 and a limited amount of all inclusive VIP – $300. Tickets are available countrywide at Smart Showrooms, Cellular World, LA Fashions and LA Fashions Too. Some sponsors for this event include Belikin, Coca Cola, Best Western, BTB, Central TV and Internet and Cellular World among others. It’s all happening at the Hour Bar Field in Belize City on Saturday May 30th and tickets are going fast. Doors will open at 8:00 p.m and this is a musical event you surely don’t want to miss.